An Achievement guide for Sekiro: Shadows Die Twice players who want to get that little more from the game! Unmissable. 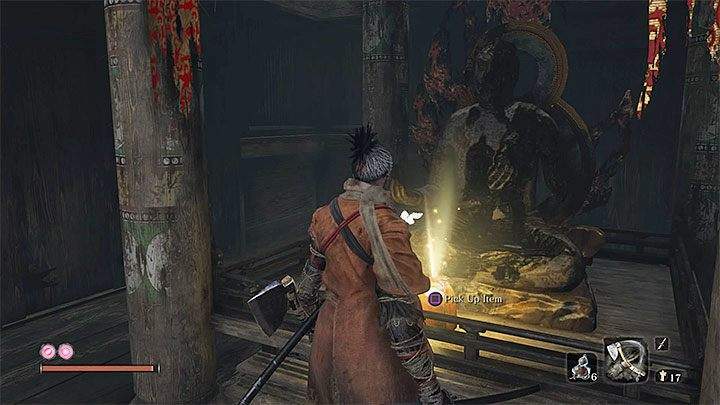 After being defeated by Genichiro Ashina in the prologue of the game, you will awaken in the Dilapidated Temple with a prosthetic limb courtesy of the Sculptor; the man who has dragged you into the temple to begin with. Unmissable. This will happen in the prologue upon meeting Kuro in the Moonview Tower. You will proceed through a cutscene that will show you receiving the blade from your master and the achievement should pop. Returned from the dead using resurrection for the first time. 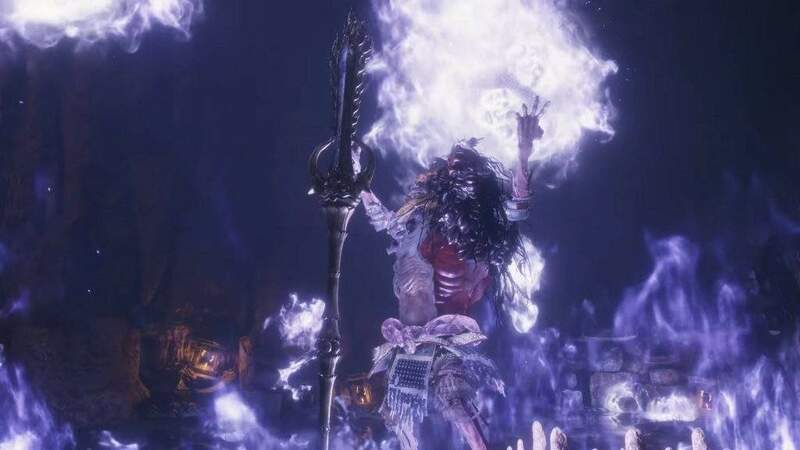 Once you die to some of the unforgiving mechanics in the game, you will be greeted with your first opportunity to resurrect. Since shadows die twice apparently, you have the ability to get a second wind after you perish. Once there. move through the hole in the building. Move out through the next hole. Subsequently, move to the gate directly north. Grapple onto the gate you just ran to. While on the gate, you should see a path leading left and downward. Follow that. At the bottom of the path, take a left around the mountain. Almost immediately to your left, you'll see a grapple location. Fling! Once up, look back to where you came. You'll find a grapple spot in front and above. Afterwards, look directly up. One more jump! Bingo! You found the tent vendor! 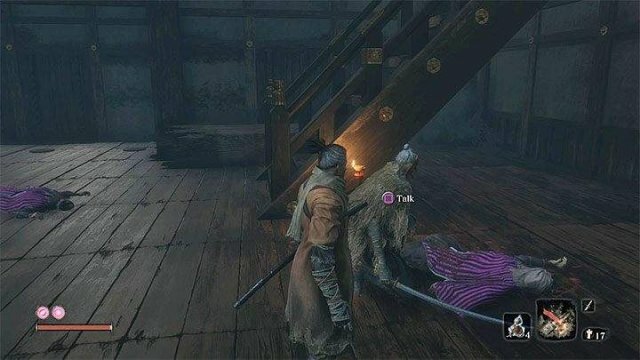 Defeated Great Shinobi - Owl. 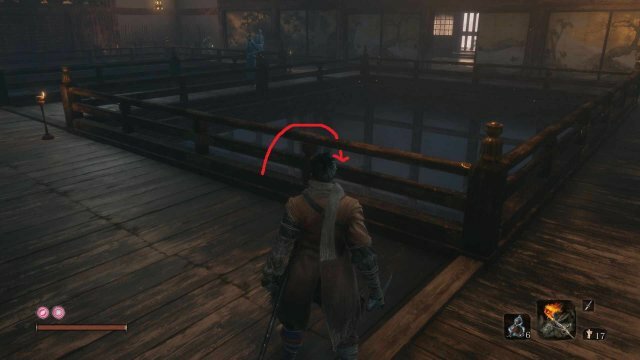 Defeated Isshin Ashina - Follow the "Shura" ending to achieve this! Folding Screen Monkeys - Caught the Folding Screen Monkeys. Gracious Gift of Tears - Defeated Divine Dragon and obtained the Divine Dragon's Tears. Father Surpassed - Follow the "Purification" ending to achieve this! Sword Saint, Isshin Ashina - Follow any of the endings but "Shura" to achieve this! After beating Snake Eyes in the Ashina Depths, continuing further down will offer you a chance to kill the Guardian Ape once again. The exact same move-set from his headless form will be present here. You will not have to worry about feces flings or poisonous flatulence. Just his fear shriek. For this fight, you won't be able to cheese his dive ability like you did the last Guardian Ape fight. The arena is much too small. This time, you'll want to stick close to him and grab opportunities to slice in between his shrieks. This is by far the best method. Once you get the first deathblow down, he'll summon another ape to come down and fight. This is a lot easier than it actually sounds. Equip your fireworks prosthetic and use this against the secondary ape. You'll find their stagger bar goes up considerably. It took me about twenty seconds to kill. Then you'll go back to fighting the Guardian Ape just like you did before! Once you deliver the final deathblow to him, you'll want to slice his corpse a few times to allow a third deathblow on the insect that was controlling him. You'll go into an animation with the mortal blade and execute them for the achievement. Grasped the inner mysteries of any combat style. Simply purchase the last skill in any branch. The Ashina Arts branch seems to be the easiest since it has the lowest number of skills to a tree. Otherwise, progress through the game normally until you happen to reach the end of a tree naturally. Upgraded Vitality and Posture to their limit. Fit with descriptions and locations for all items pertinent to upgrading vitality and posture. Dropped from the General Naomori Kawarada mini-boss. Specific location: Courtyard past Gate Path idol. Dropped from the Chained Ogre mini-boss. Specific location: The top of the stairs past the Stairway idol. Dropped from the General Tenzen Yamauchi mini-boss. 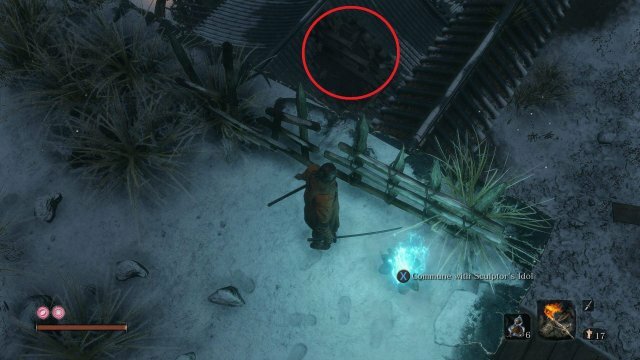 Specific location: Past the Chained Ogre; in the courtyard filled with riflemen. Specific location: Building in the Gyoubu Oniwa arena. 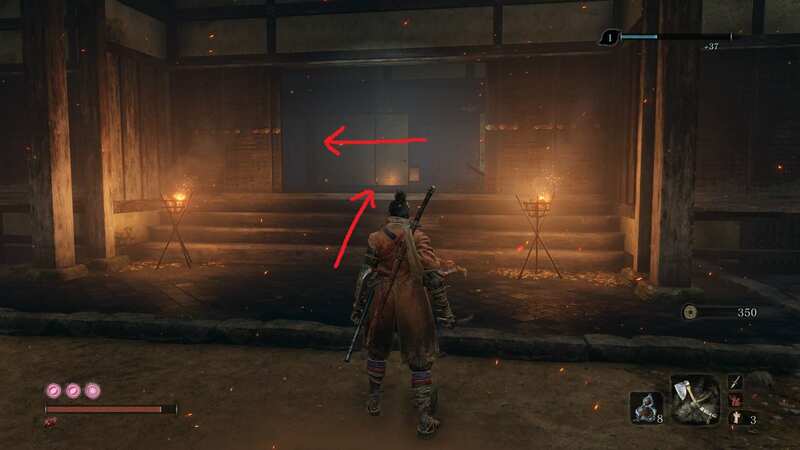 After defeating Gyoubu, proceed towards the large staircase opposite of the idol. You'll find a large building to your right. Enter this building and proceed up the small stairs. When looking up, you should notice a grappling position. After this, double-jump into the attic and open the chest. Dropped from the Blazing Bull mini-boss. 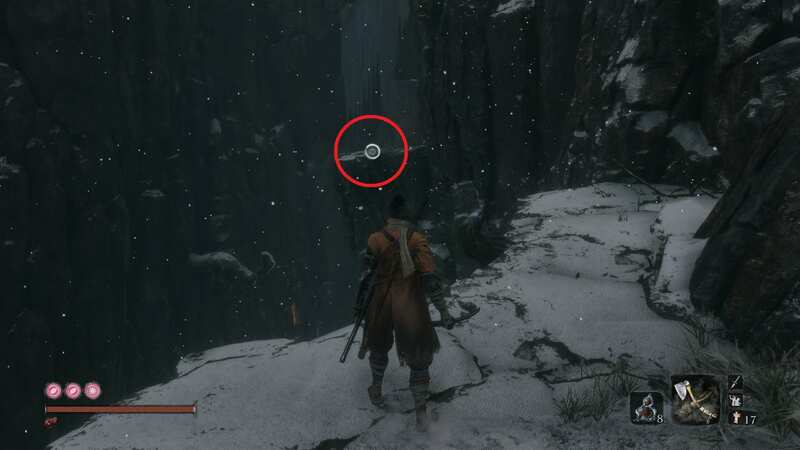 Specific location: En route to the Ashina Castle. Unmissable. 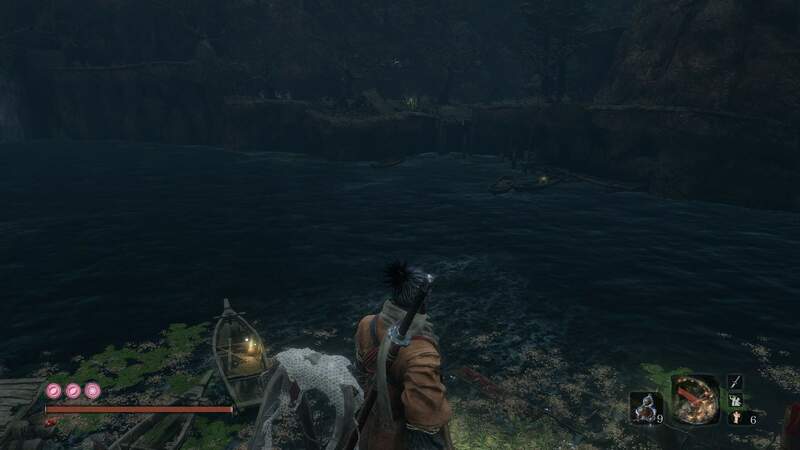 Dropped from the Shinobi Hunter Enshin of Misen mini-boss. 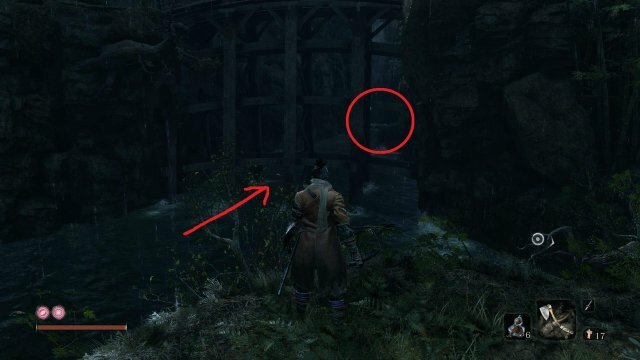 Specific location: North from Estate Path idol after crossing large bridge. Dropped from the Juzou the Drunkard mini-boss. Specific location: From the previous bridge, jump into the water and swim upriver. Specific location: Building behind Juzou the Drunkard. After beating the Juzou mini-boss, proceed into the building behind him and immediately turn down the left hallway. You should find two enemies patrolling. Kill them and continue down the hall. Upon taking another left, you'll notice poster on the wall. Hug the wall and reveal the secret door. Specific location: Ashina Castle idol. Directly up the long flight of stairs. Specific location: After entering Ashina castle, take left path to Reservoir. 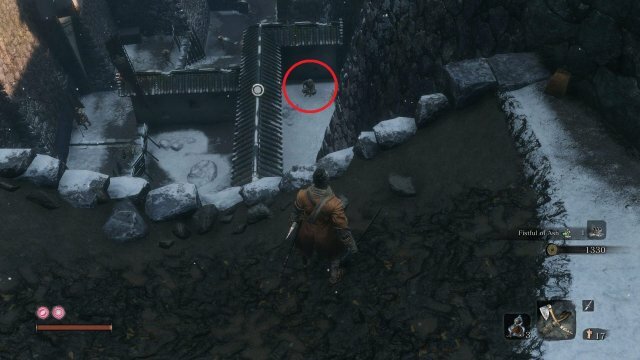 The enemy camp in front of the Reservoir idol is where you'll find this boss. 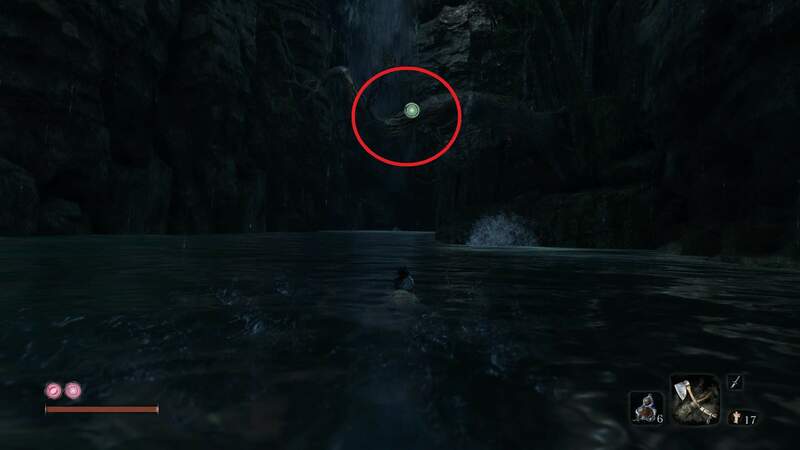 Specific location: From Reservoir idol, grapple the branches on the left. You'll fling towards the drumming enemy. Behind that drummer is a cliff behind. 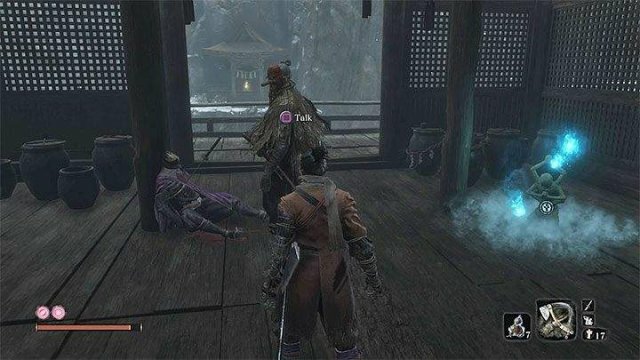 Grapple and find the 'friendly' samurai. Sold by a merchant for 1400 gold. 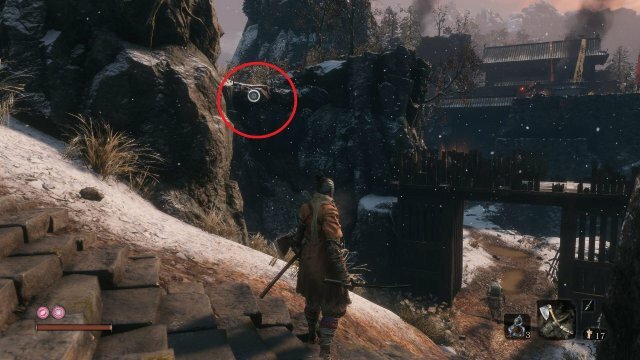 Specific location: From Ashina Castle idol, jump off the left side of the bridge behind you and grapple to the opposite side. From the wooden bridge now in front of you, proceed forward and grapple over the wall. Through there is the abandoned dungeon and the merchant. 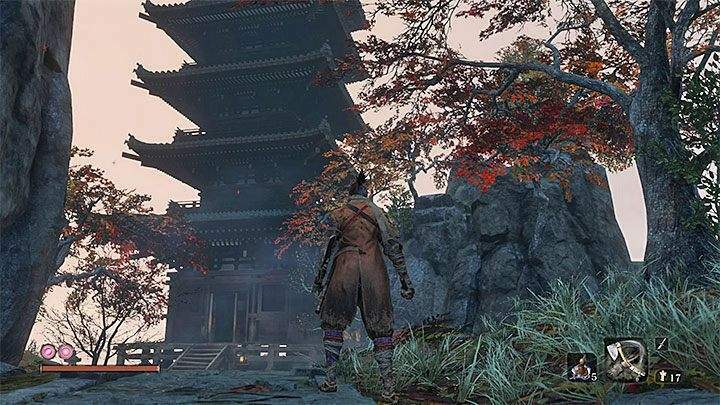 Dropped by Ashina Elite – Jinsuke Saze mini-boss. 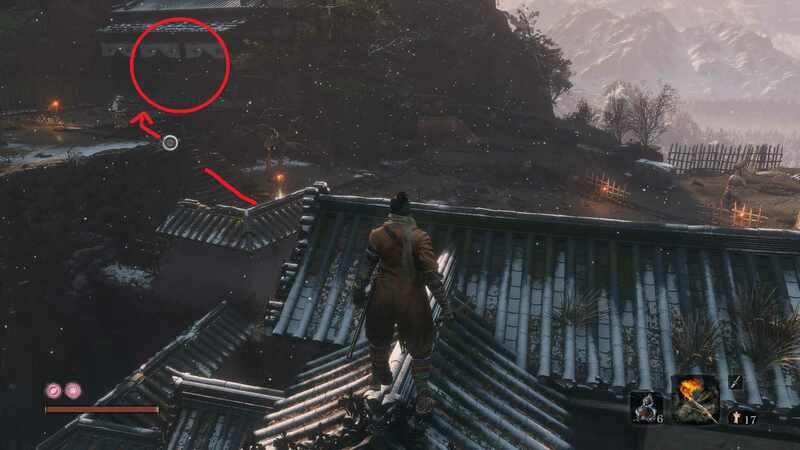 Specific location: As you move to Genichiro's location on top of Ashina castle, you'll have to pass through a room to fight Jinsuke Saze. You'll get the prayer bead after defeating him. Dropped by Armored Warrior mini-boss. 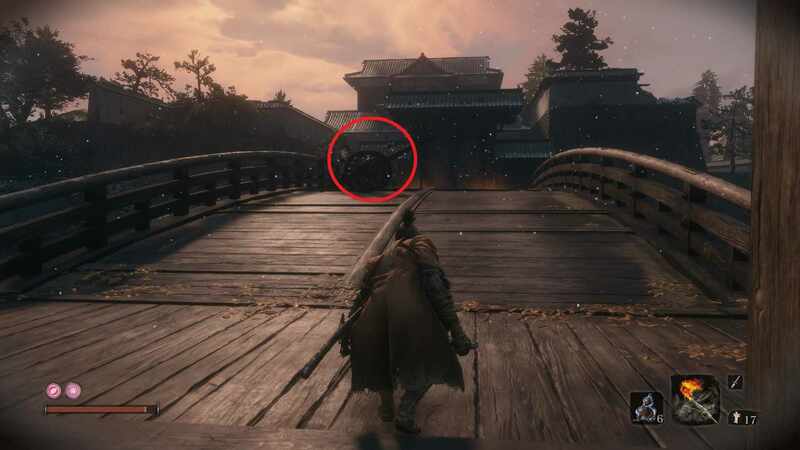 Specific location: After the second idol in Senpou, you'll find a long bridge. 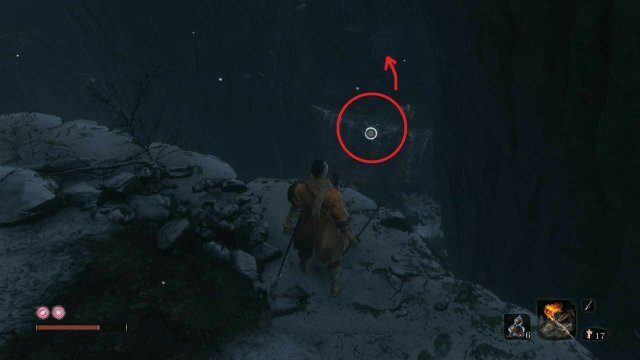 This is an unmissable location and is needed to proceed with the game. Dropped by Long-arm Centipede Sen'un. Specific location: Temple Grounds idol. 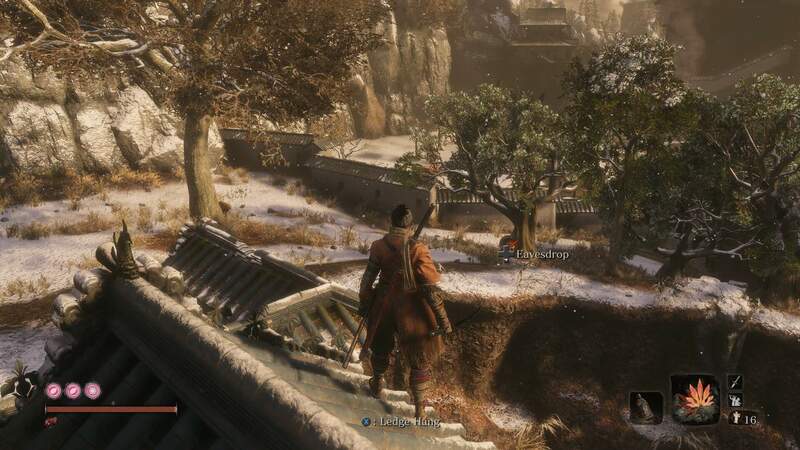 Follow the rightmost path with hostile wolves then climb up the temple roofs. Once there, you should find a lower temple beneath you with its door opened. Inside is Sen'un and your bead. 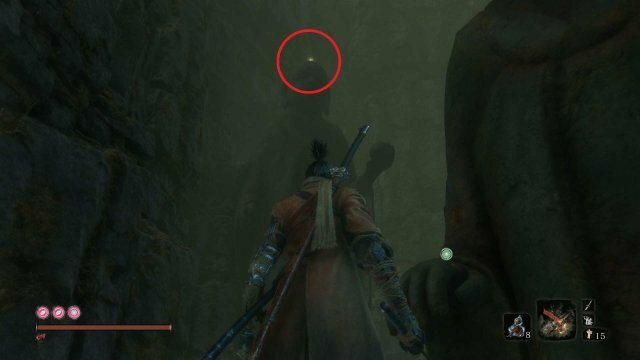 Specific location: From the Under-Shrine Valley idol. Right after traveling to this idol, turn behind you. You'll notice a grappling location with two ranged enemies on it. Jump and kill them. To your left, you'll notice two double-jump walls. Climb those then move forward to hug the wall. Once you reach the out-cropping, you'll find your prayer bead. Dropped by Snake Eyes Shirafujki mini-boss. Specific location: From Sunken Valley idol. Drop down the cliff by the idol and hang onto the trees. Soon enough, you'll reach a small island with this sniper boss. Dropped by Long-arm Centipede Giraffe mini-boss. Specific location: In the room from the Gun Fort idol. 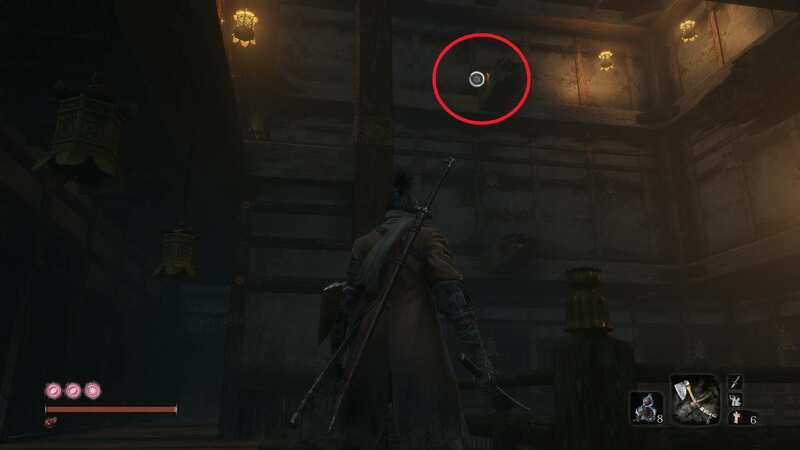 Specific location: Underneath the Gun Fort mini-boss room. Climb through the floor and through a small corridor. Once you come out on the other side, you can grapple above you and subsequently grapple to other things on your right. The prayer bead will be at a dead-end with a bunch of lizards. Dropped by Snake Eyes mini-boss. Specific location: Travel through the Ashina Depths until you find a room with a bunch of cannonball enemies. In the middle, you should find Snake Eyes. However, if you detour to the opposite side of the room, you'll find the Poison Pool idol so you can rest. 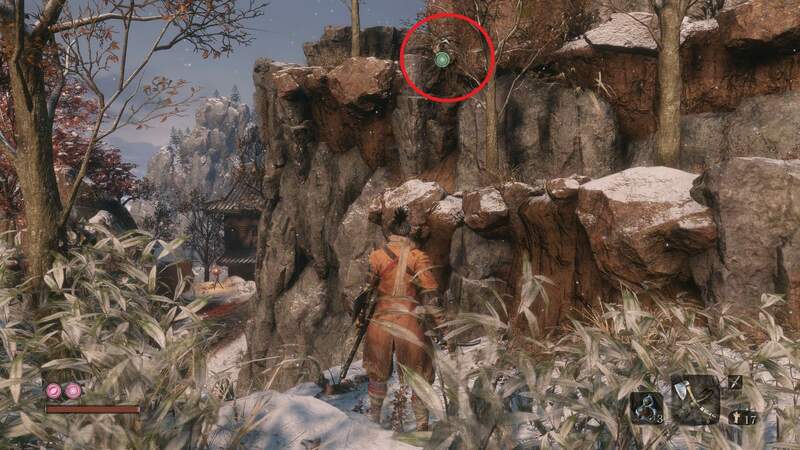 Specific location: Travel to the Poison Pool idol and move as if you were going to fight the Guardian Ape down in the depths again. Before actually going down, you'll notice a grappling location. 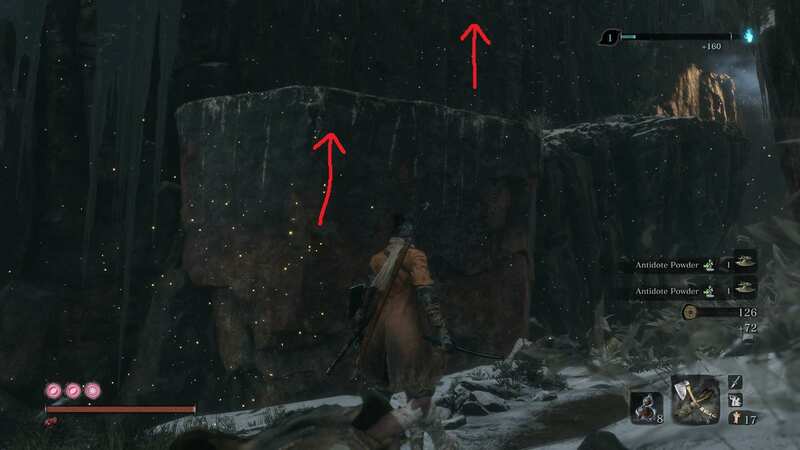 Fling there and when you crawl under the first cave ceiling, look to your left for a ledge. Notes: Make sure to stab the centipede after to get Immortality Severed achievement. 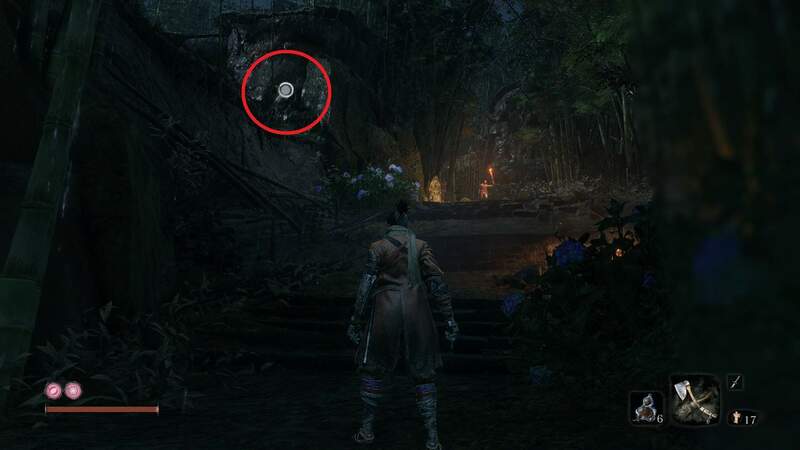 Specific location: Moving from the first Hidden Temple idol, you'll find a second area past the small Buddha statue. 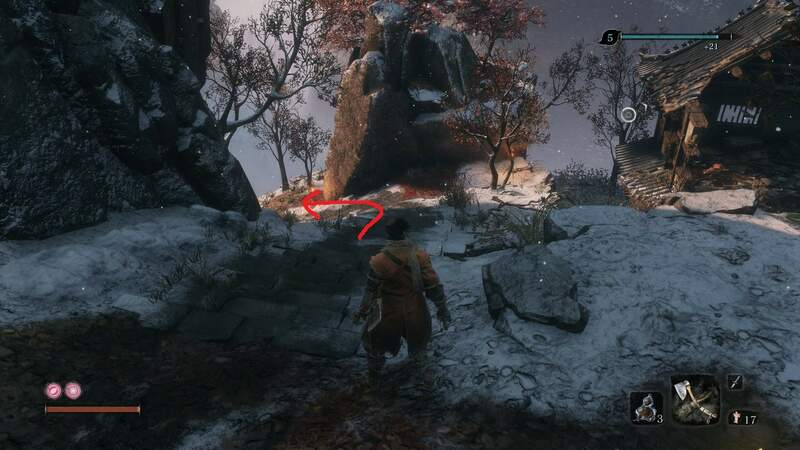 On the leftmost wall, you'll find a grappling position that will take you onto a small ledge. After this ledge, you'll find a Glutton mini-boss surrounded by little monkeys. I have to write this one out because it gave me a different time. Upon getting the Water Mill idol, progress like you normally would. You'll go past the lute lady and over the bridge, soon stumbling upon a decrepit house with a swarm of enemies inside. You'll want to jump into the river on your right. Not the one further down, the closest river to you. Once there, you'll want to swim under the bridge and tilt your camera towards the upstairs of the house. Position yourself up against the closest stone wall to the house. Jump and then backflip jump. It should give you the height needed to grapple up. If you're having trouble with the backflip jump, it's pretty simple. Just jump once and when you press again to do your regular double-jump, just move your character backwards during it and you'll backflip from against the wall. When approaching the Mibu Village for the first time, you'll notice a large lake right beside you. With your new diving ability, you'll be able to jump into the water and find a glowing chest underneath. This will have a prayer bead in it! 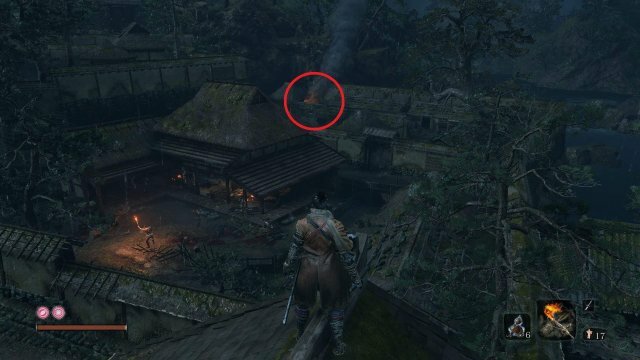 Specific location: From the idol, grapple onto the roof and you'll find an area to fight the bull after following said roofs for awhile. Kill it for a prayer bead. Dropped from Leader Okami mini-boss. Specific location: When you reach the Palace in Fountainhead, you'll find a large tree towards the lake. 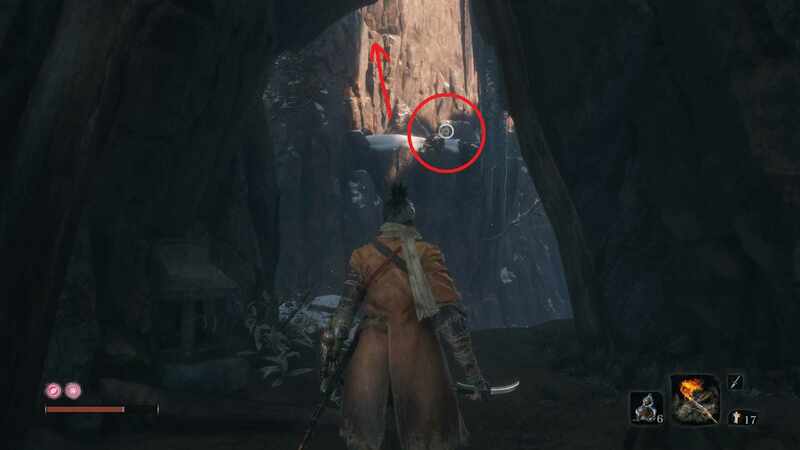 On the branch, you'll find Leader Okami. Fairly easy to kill and has a bead. From the idol, look towards the lake and jump in. 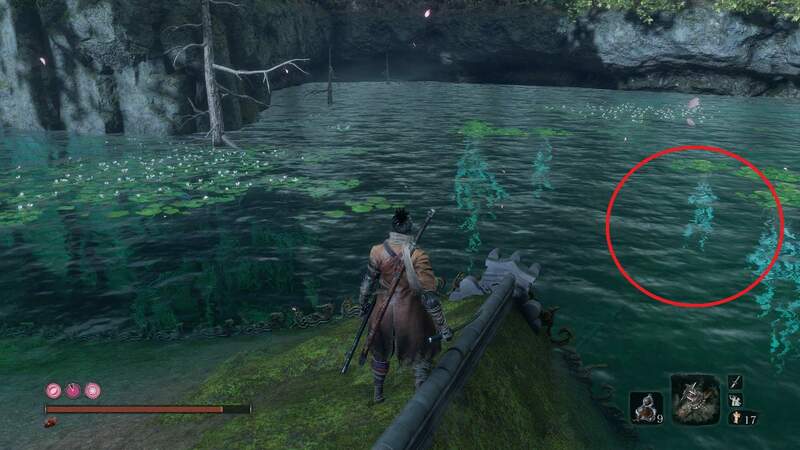 With your new dive ability, go underwater and start swimming quickly to the rightmost side past the sunken house. You'll find a chest with a prayer bead in there. Be careful of the Headless, though! Dropped from Lone Shadow Vilehand Mini-boss. 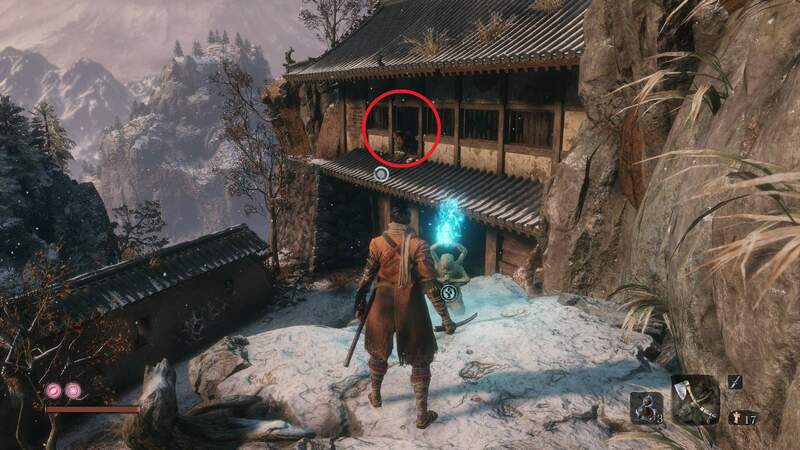 Specific location: Travel out of the Upper Tower and head back to the window you exited while going to fight Genichiro. You should find a mini-boss there. Kill them for a prayer bead. 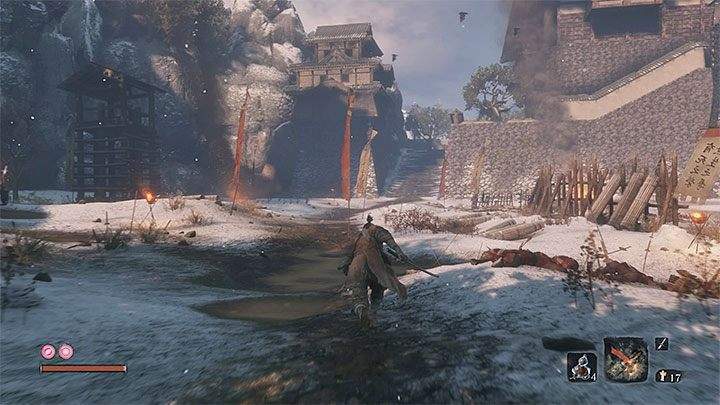 When you are tasked with finding Kuro, you'll stumble into a war-torn Ashina Castle. 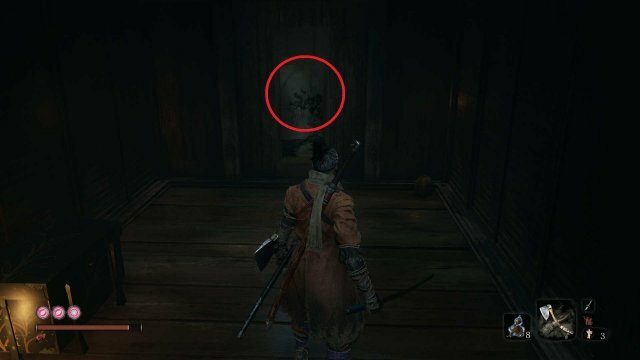 You'll want to head out and attempt to run back to the Ashina Reservoir idol. It might be a bit tricky, but there's a certain door near the idol that you can open from the Ashina Castle side. After you do that, you'll notice two enemies. One you've already fought. Seven Achina Spears! But it looks like he has a partner this time around. Now, it's near impossible to kill them both at the same time unless you want to have a long engagement. Instead, you can cheese a bit. Stand exactly where I am in the image. 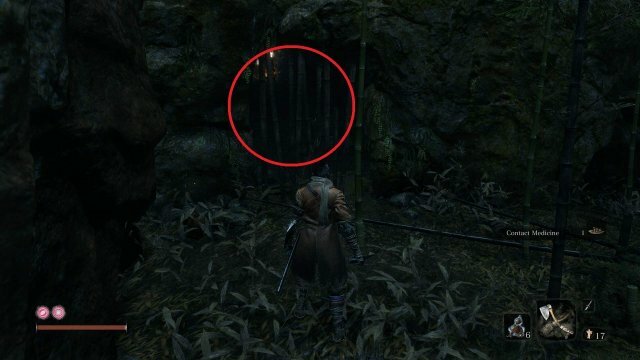 You'll trigger the swordsman to be suspicious and come walking over to you. We want this because we can assassinate him for free and turn the fight. 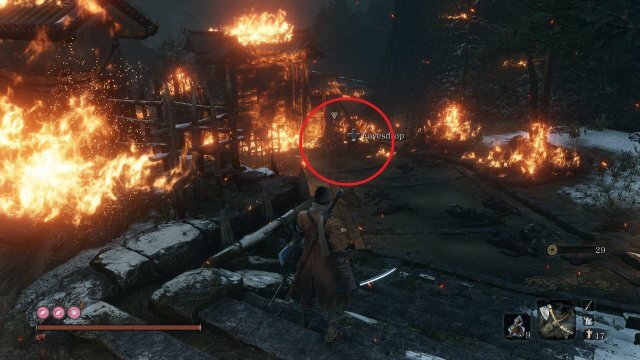 Crouch down near the left and hide yourself within the fire. 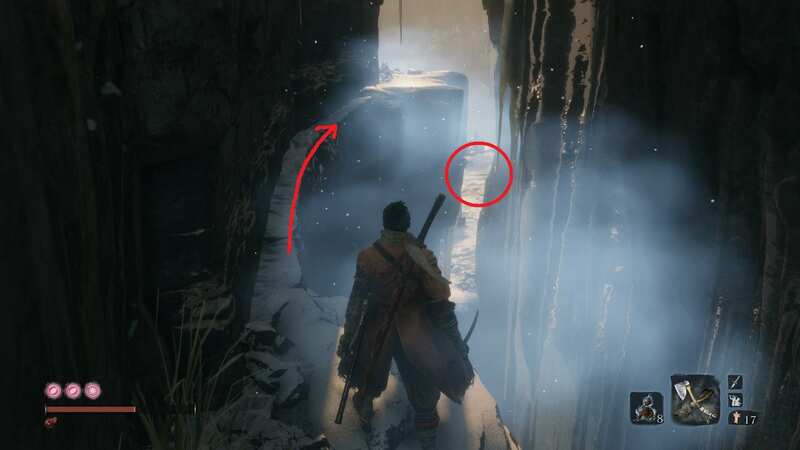 Whenever he gets near the first step, you'll want to quickly crouch along the wall and off to the left side. From there, you can sneak up behind him and deliver the deathblow! Afterwards, you'll go ahead and start the encounter with the Spear mini-boss. You'd do well to Mikiri counter as well as parry here. Posture damage him since he has high armor and will deflect most slices. Watch out for his horizontal sweep ability and keep the pressure! If you really feel like you're losing, there is a couple of branches to grapple to out of the arena on the left. 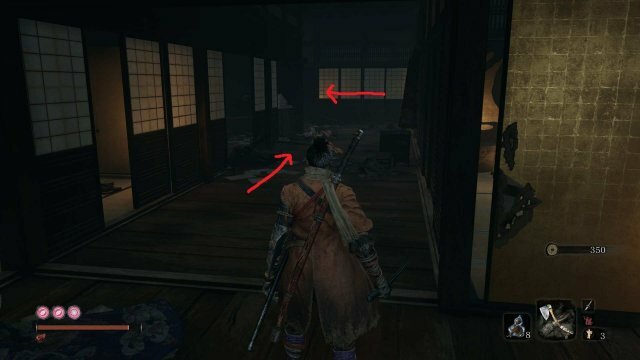 After you've traveled back through the window that you originally came through to get into the castle, travel down the hallway and you'll see a room with two samurai fighting one another. On the back wall, you'll notice a poster. Hug the wall and you'll go through. A chest with a bead inside. 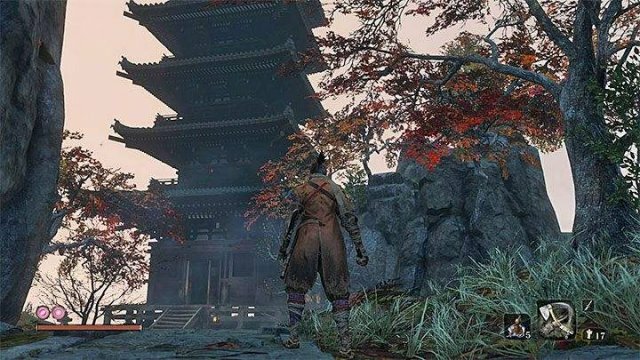 Upon defeat at the Great Serpent Shrine, you'll find Lone Shadow Masanaga the Spear-Bearer at one of the shrines outside of Ashina Castle. He will drop a prayer bead. 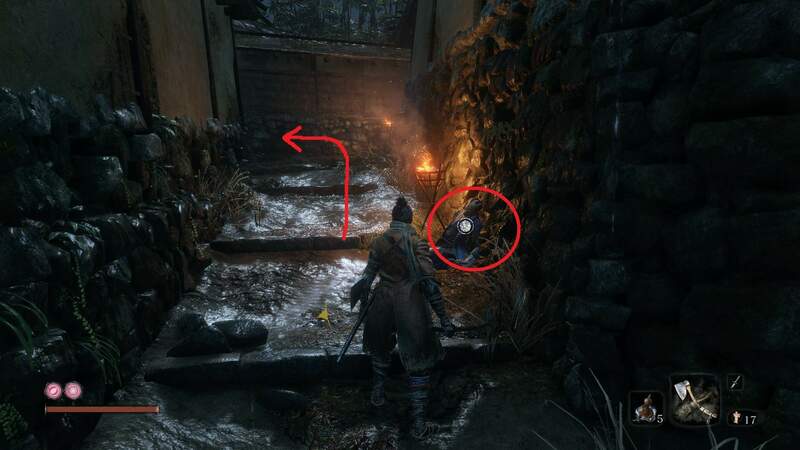 This is dropped by the Chained Ogre after the Castle has been overrun with Shinobi. 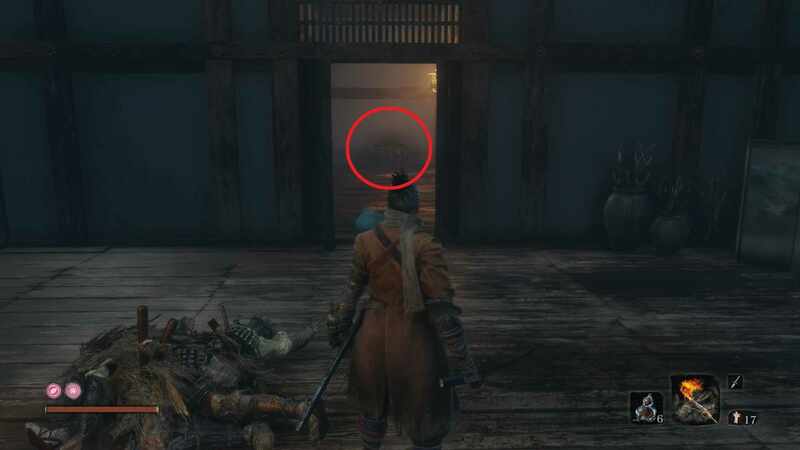 Jump from the Antechamber Idol where you find an old lady and two samurai walking in tandem. You'll find the Chained Ogre again. Kill him for a prayer bead. 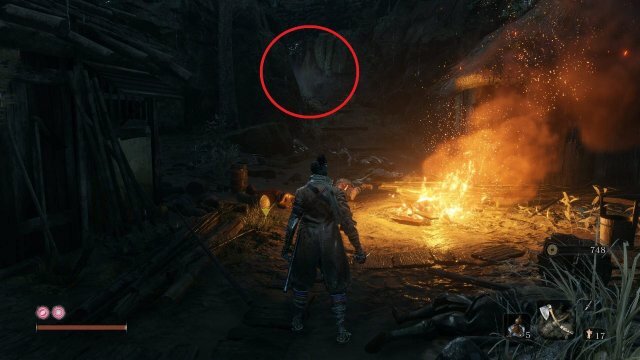 This one I haven't found yet myself but here is the description from the Sekiro wiki. Dropped by Red-Eyed Ashina Elite - Ujinari Mizou in the hidden Dojo below Isshin Ashina's Room after Ashina has been set ablaze. 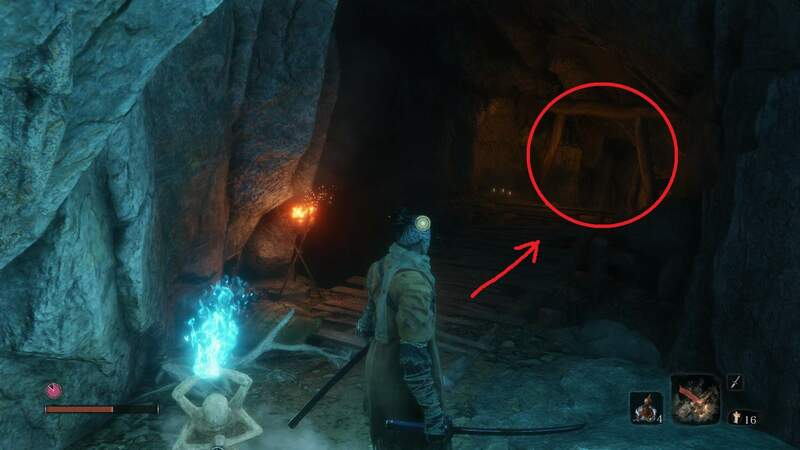 This is the same room that contained 3 Nightjar Shinobi prior to defeating Genichiro Ashina and contained 1 Nightjar Shinobi and 1 Lone Swordsman Shinobi after Ashina Castle has been overrun by Shinobi. Dropped from Shigekichi of the Red Guard Mini-boss. 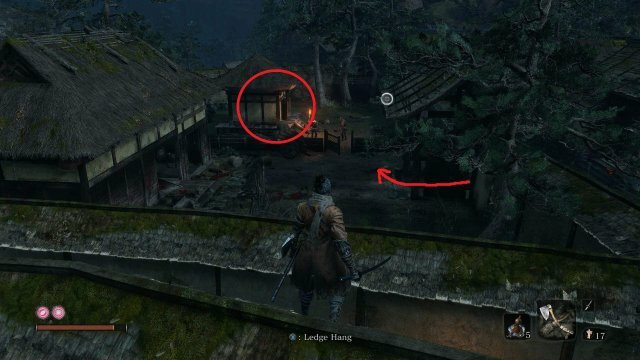 Specific location: Located in the courtyard past the Outskirts Wall's Stairway. Senpou Temple, Temple Grounds (After Dive Mechanic). 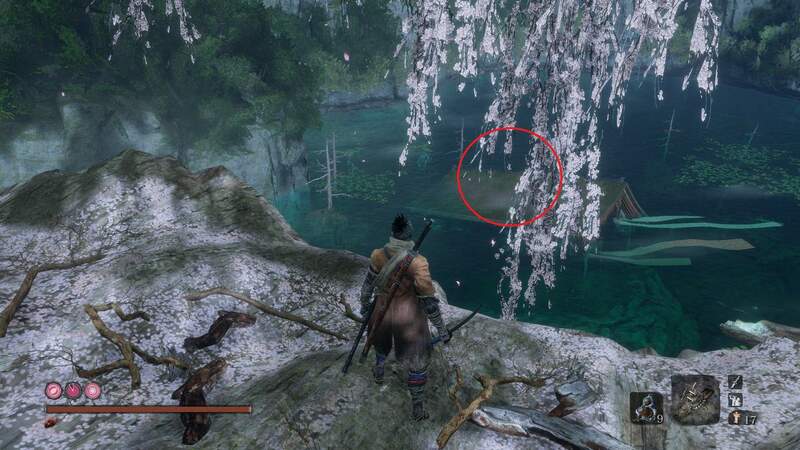 From the idol, jump into the small pond and swim down towards the statue underneath. 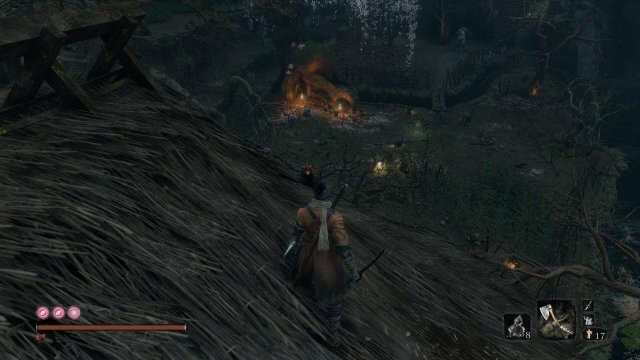 Both drop from Boss / Mini-Boss after receiving bell from Emma and being transported to Hirata Estate again. Fully upgraded the "Healing Gourd". Upon reaching the Outskirts Wall idol, you will progress to find General Naomori Kawarada blocking your path. A mini-boss that has a two deathblow requirement until death. Upon defeating him in combat, you will receive your first gourd seed. 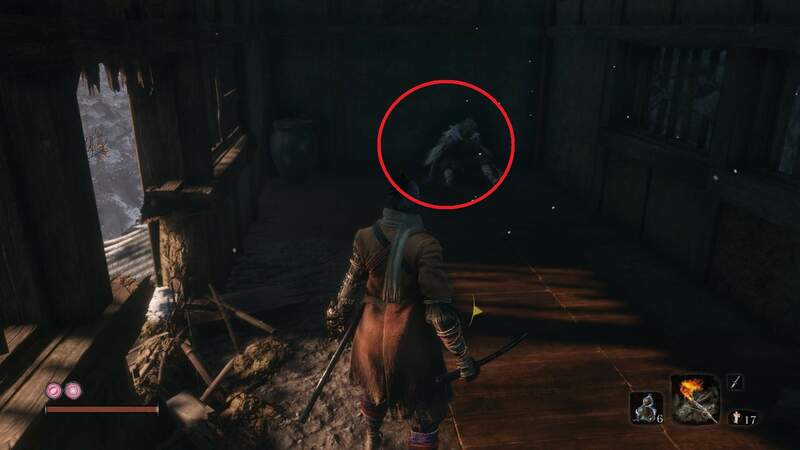 Try stealth-stabbing him to get rid of the first deathblow easily. After the Chained Ogre encounter, grapple to the building directly behind where he was chained and immediately turn to your left. 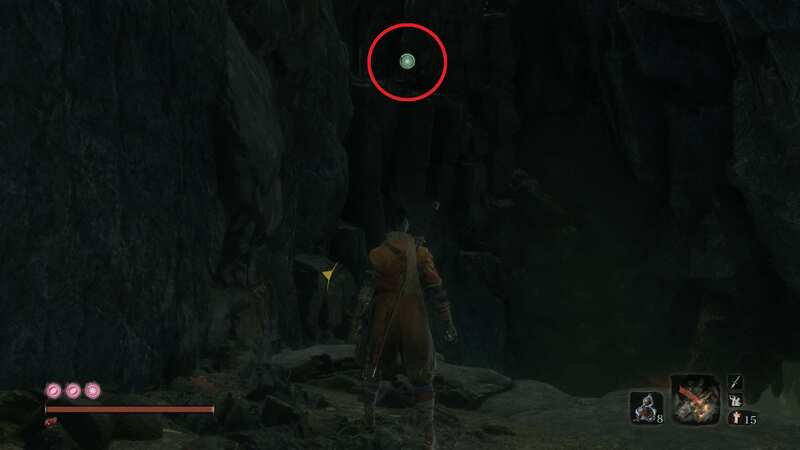 Once inside, you should see a glowing item on the ground that will deliver you the next gourd seed! After defeating Gyoubu Oniwa, across the battlefield where you fought him, you will find a staircase. Upon following the staircase, turn to your right and walk towards a large tree. From the tree, directly to your left is another staircase with a vendor at the top. The vendor sells the gourd seed for 1000 gold. After defeating General Kuranosuke Matsumoto at the gates of the castle, you will have to grapple your way on the rightmost roofs to proceed into the castle. 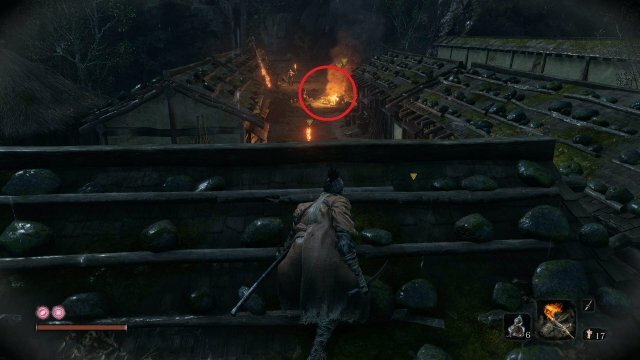 Follow the smoke signals on the roof and kill all the enemies in your path until you reach a small window that you can climb into. Upon entering the window, grab the idol so that you can save your progress. Directly behind you will be a large chest. Opening the chest and grabbing the contents inside will net you your fourth gourd seed. 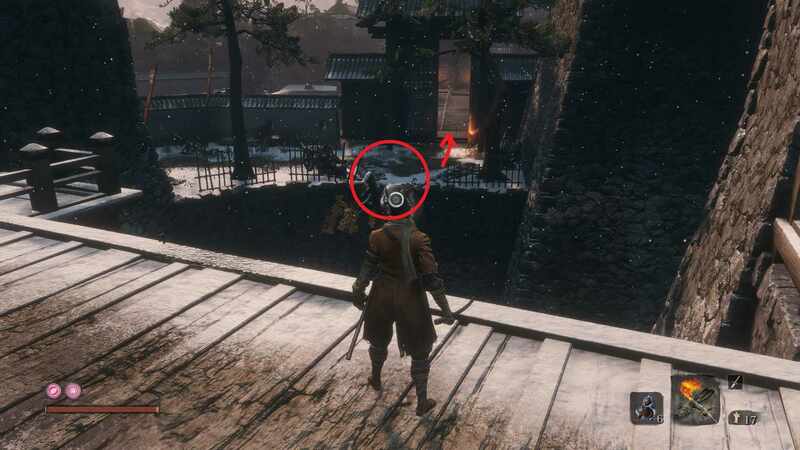 After defeating General Kuranosuke Matsumoto at the gates of the castle, turn right from the top of the steps and drop down. 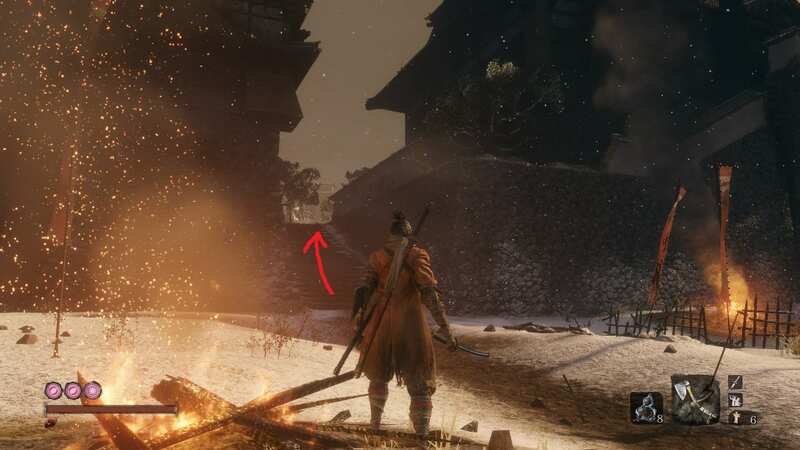 There will be an NPC that will ask you to kill all the enemies in the adjacent area. After doing so, he'll travel back to your temple. The vendor sells the gourd seed for 2000 gold. After getting your first Senpou idol, you will follow a trail where a dozen monks are meandering about aimlessly. In the back of this area is a large building. Slink up to the building and you'll notice you can grapple through the ceiling. A room with three monks will hold your seed! After the Under-Shrine Valley checkpoint, you'll want to proceed as normal. You'll grapple once to a tree branch and then to another. There is progression to the right, but we'll want to go left up a hangable wall first. Once you've scaled the wall, you'll find another grapple that will take you to another wall. Climb up that to find a small hut on top. Inside you will find some nice items, but also another gourd seed to increase your flasks! 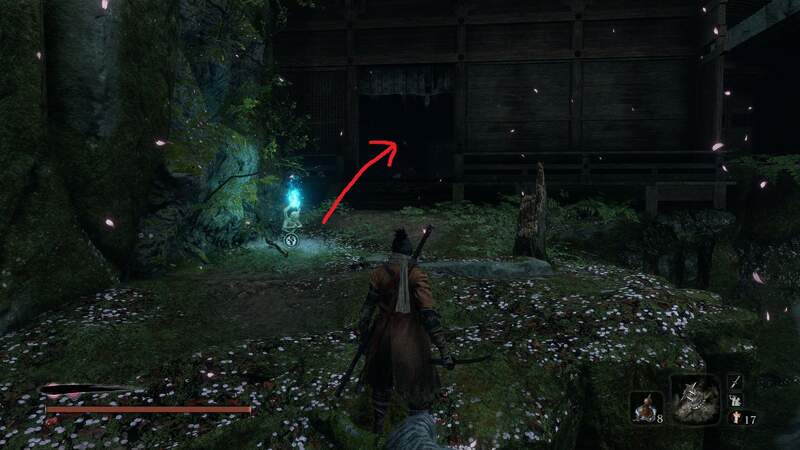 Once you get the Mibu Village idol in the ravine, you'll want to enter into the town. Upon entering, you'll notice a glistening, magical tree that is almost impossible not to see. Move up to the tree and there should be two items. One of them is a gourd seed. 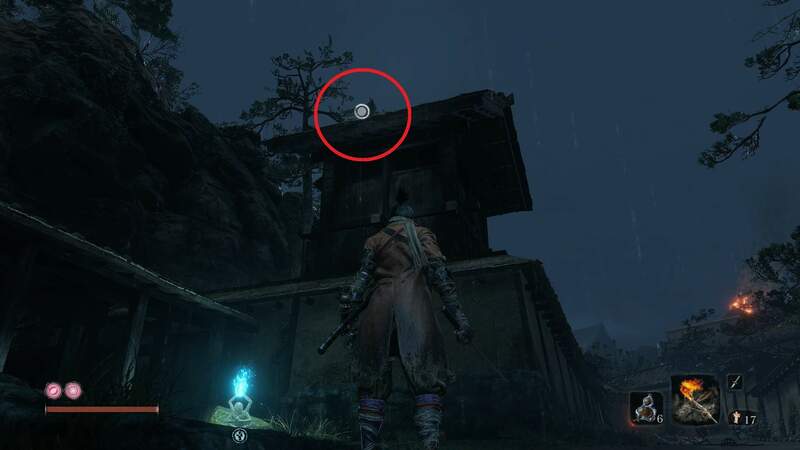 Once you reach the Great Sakura idol on the palace, hook onto the tree in front of you and gaze to the west. You'll notice a half-sunken house with a woman on it. Traveling there, she'll tell you about a Great Carp that hides among the underwater caves. Directly in front, there is such a cave! Swim through and dodge the Carp as you do so. You'll end up through another sunken house and towards another idol. Once you grab this next idol, go ahead and enter the dark room directly ahead. Kill all the enemies and approach the chest. 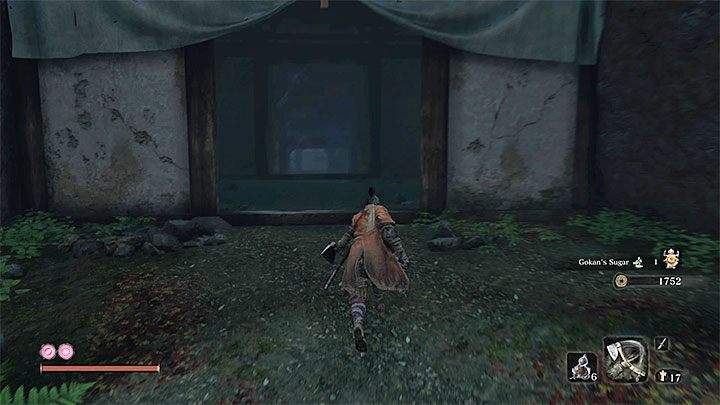 The first you'll receive from defeating Genichiro. The second you'll receive from defeating the Folding Screen Monkeys. The third you'll receive from defeating Guardian Ape's two forms. Used Lapis Lazuli to upgrade any tool to its limit. This will come much later in the game when you get to the Fountainhead. 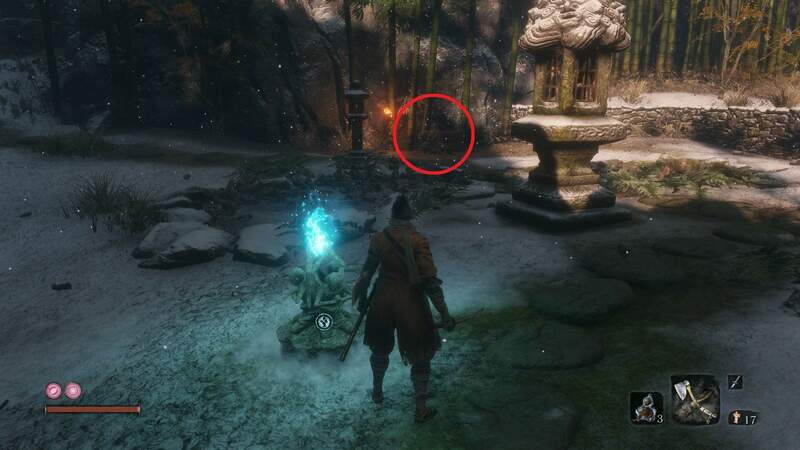 From the Great Sakura idol right next to the large tree in the palace, jump onto the tree and look behind. You should notice a river coming downstream from a waterfall. Follow it upstream and kill a few wolves on the way. 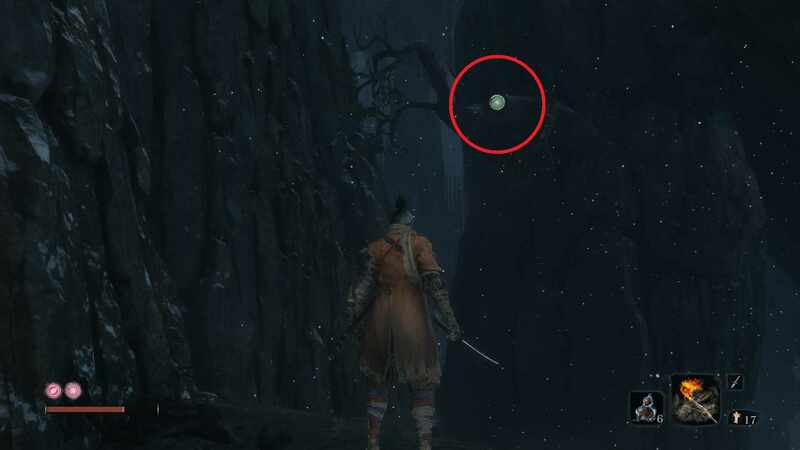 When you look towards the waterfall, you'll notice a Shichimen Warrior with glowing purple balls around him. 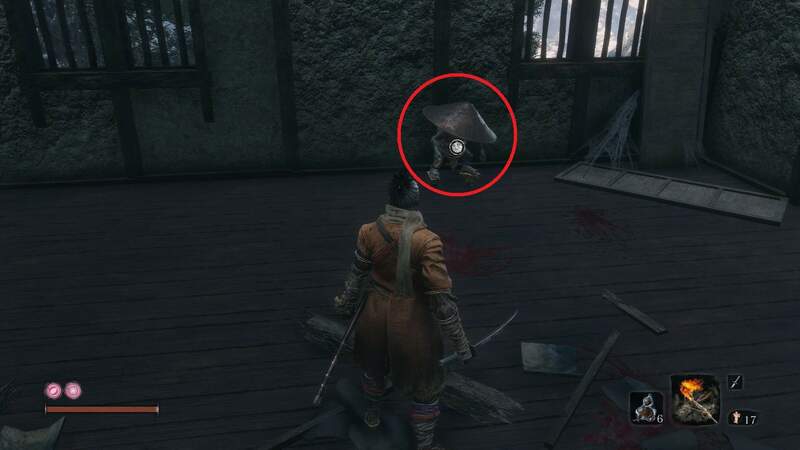 You should have fought this exact same enemy before, but if you're unaware, they look like the below image. You'll want Divine Confetti for this fight. Rush him almost immediately and start slicing away. At a certain point, he'll disappear after you've hit him enough and teleport at a point far away from you. You'll see that he begins charging a large laser that deals fear. Run diagonally against the beam so that it doesn't hit you. Even if it does, it shouldn't be enough to deal all your health unless you were already low. After the laser ends, continue to beat on them with your Divine Confetti sword. Upon killing it, you should drop a Lapis Lazuli. Lapis Lazuli is one of the reagents to upgrade your prosthetic tools the highest that it can go. You'll probably end up getting this through a secondary playthrough, so I'd recommend just saving that Lapis for now and moving on. Don't worry, your items will carry over! Traveled to all areas of the game. There are reports that certain paths you've chosen during the game will take away the ability to get into the Fountainhead Palace, which is the last place you'll need to go for this achievement. I'd recommend killing your father and pledging loyalty to Kuro to make this happen. 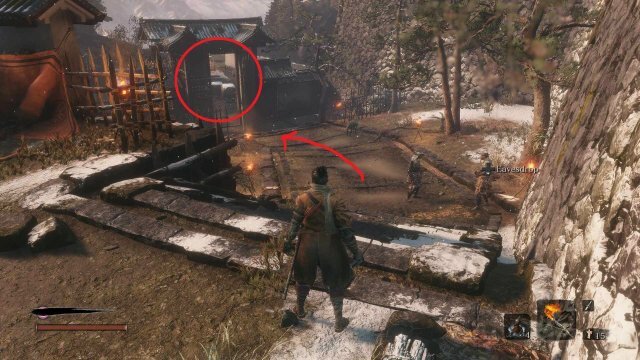 Here are all the locations you should have. You should find all of these naturally through progression, but if you're struggling with something in particular, I'll be happy to help you out. Otherwise, you can wait until I release the full walkthrough guide adjacent to this one. It's also worth noting that you don't need the idols specifically. Truthfully, you may not even need to visit every single sub-location. But just to have a comprehensive list in the guide, I guess. Exactly what it says. You'll want to acquire all the skills from the three trees. You can either farm experience in certain zones or you can start new game plus and work towards them again. 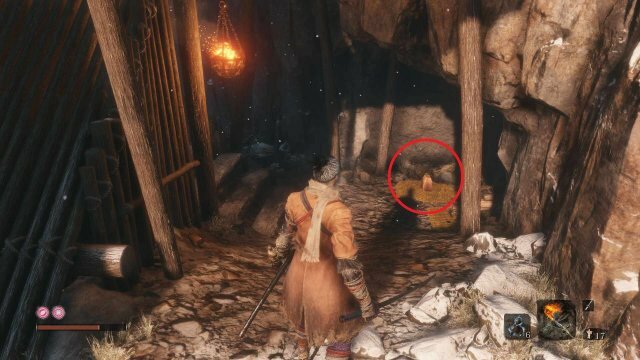 This book is obtained by the Sculptor himself after finishing the prologue and gaining 1 Skill Point by visiting Ashina Outskirts. This book is rewarded by Tengu of Ashina after doing his first quest "The Rat Hunting"
After killing Gyoubu Oniwa run up the stairs located at the opposite side of the Idol. Go inside the temple and you'll find Tengu. 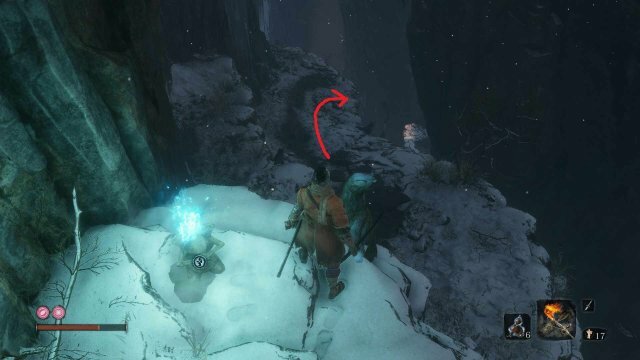 When you receive his quest, go back to the Idol, and the rats are literally above you to your right searching some trees. This book can be found in one of the buildings of the Senpou Temple. First, start at the Main Hall Idol. 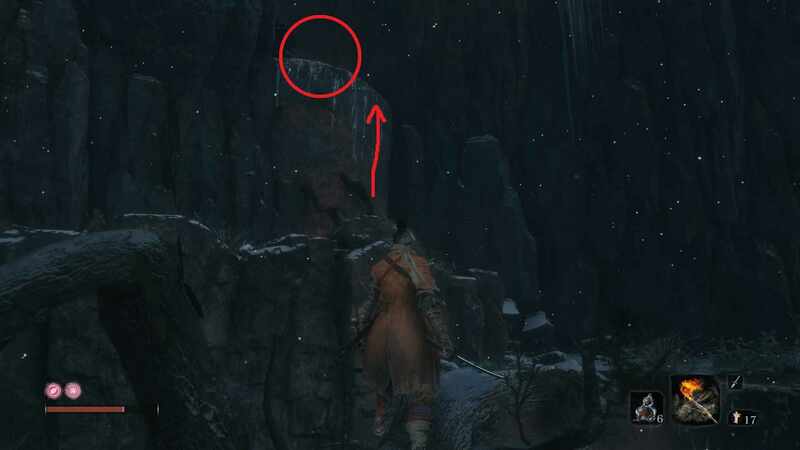 Then, search up the entrance of a cave that is right next to the Main Hall. 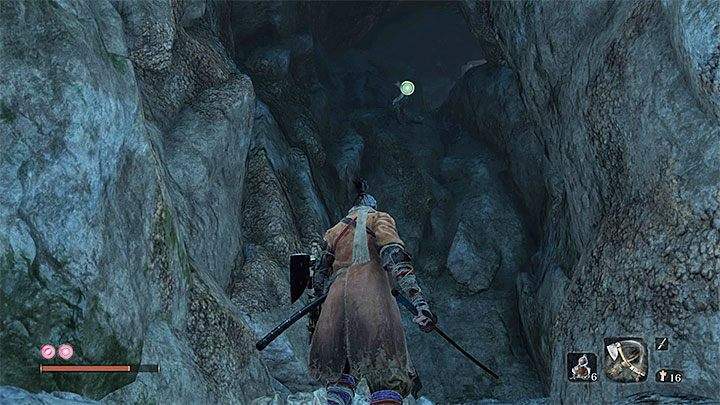 Watch out for a few mobs that are lurking around (A monk and some crawling monsters) and the cave will eventually lead two different ways but they have the same exit at the end. 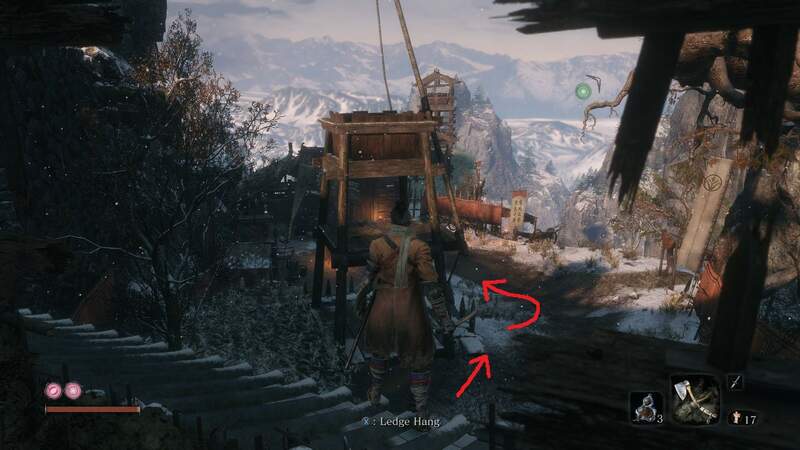 You can each said exit by grappling to the top hook shown down below. Finally, you'll reach a building with several floors. The book is inside the building. Tengu of Ashina can be found on the Great Serpent Idol (His second location) to get the book. Upgraded all Prosthetic Tools to their limit. 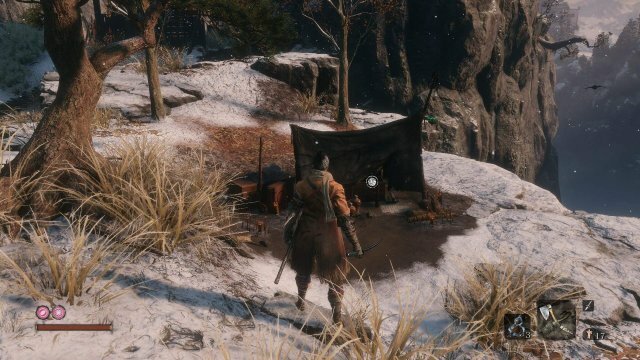 You'll want to farm gold and materials (will update with farm routes later) or you can simply start a new game plus and go through the campaign again. You'll get more than enough materials and gold to purchase everything. Be sure to get that Lapis Lazuli too! Attained the 'Immortal Severance' ending. 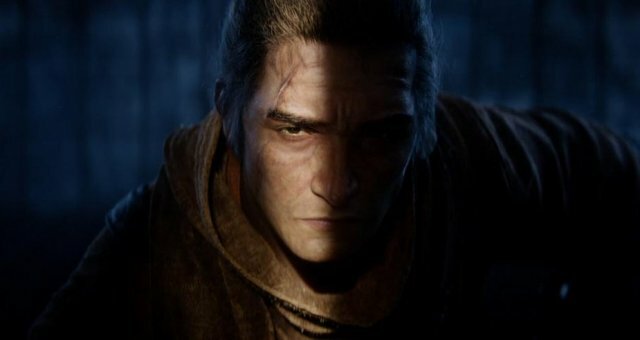 Like the previous Shura ending, you'll want to head back to Ashina Castle and trigger a dialogue between Owl and Kuro. When the cutscene ends, approach Owl and you will be given an ultimatum. You can either stay loyal to him or Kuro. Stay loyal to Kuro and defeat Owl. 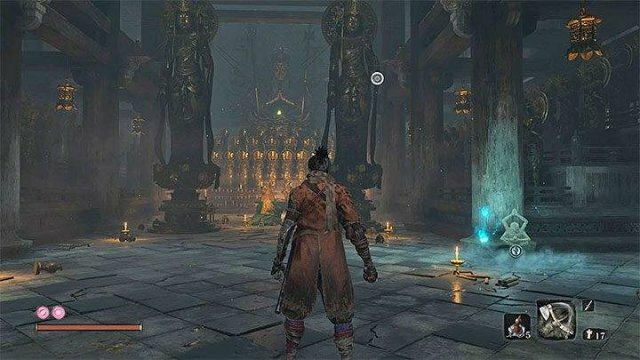 After this, progress through the story like normal without going to Hirata Estate Owl and upon beating the last boss of the game, you will have received the Immortal Severance ending and netted the achievement for it as well. Like the Immortal Severance ending, you'll want to stay loyal with Kuro and defeat Owl. After doing so, move to Isshun's place and you'll be able to eavesdrop on him and Emma. From there, you'll also be able to eavesdrop on Kuro from behind a corner. Go back to the idol and rest. After resting, go upstairs and speak with Emma about Kuro and agree with her dialogue. Move to the Old Grave idol and move into the graveyard on the leftmost side. You will find Emma again. Speak with her. After this, move to the Dilapidated Temple and eavesdrop on both of them from behind the building. 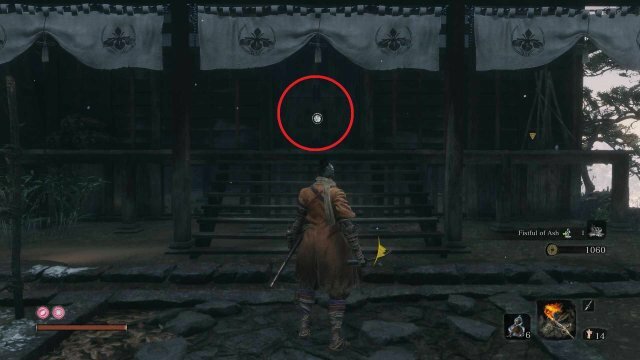 Confront Emma and you will receive a bell which you can use at the Buddha statue like you had previously in the game. Once there, move to the same arena with Lady Butterfly. You will have to defeat Owl again. After doing so, you'll receive the achievement and the ending. Just like most other endings, stay loyal to Kuro and defeat Owl. Once that's done, you'll need both fresh Serpent fruit and an old Serpent fruit. For the latter, head to the idol just before the Guardian Ape arena and turn around. You'll notice an old lady on the cliff. Speak with her. She'll point forward towards the cliff and tell you that the old fruit is forward. 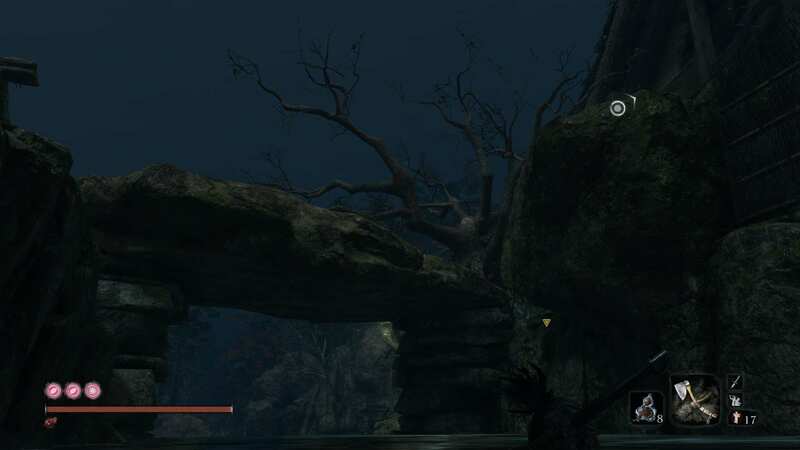 You'll jump forward with a running start and be able to grapple onto a branch below. Keep following this until you find a large cave with a serpent spinning around it's crevices. You'll run all the way to the back of the cave and notice a small house. On the leftmost side, you can drop down on a small ledge and get closer to where you need to grapple towards the snake. Puppeteer ninjutsu on the monkey to distract the snake and grapple up quickly. From there, enter the house and snag the old fruit on the statue. 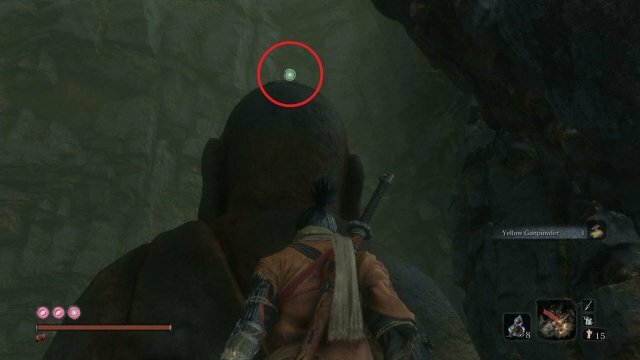 If you're missing the fresh fruit, you'll want to transport to the Senpou Temple idol and jump off the cliff directly following this idol. There will be a small enemy and a lever with an attached kite. Puppeteer Ninjutsu by deathblowing the enemy twice and he will raise the kite. Proceed up through Monk territory, grappling up into the building and moving past the room with the three monks praying to an undead creature. Once you hop out of the window, there will be a large tree to grapple onto. Afterwards, you can grapple onto the kite and fling on a ledge. On the rightmost side beneath you, there will be a number of grapple locations. Jump down and grapple quickly. This will transport you to an area where you can deathblow the giant serpent from before. If you want more information, view the Great Serpent achievement. Once you've gotten the fruit, you'll want to head back to the Inner Sanctum in Senpou. From there, you'll want to keep getting rice from the woman. To do this, receive the rice once and then rest outside. Go back in and do it again. After you've exhausted all the dialogue, you'll be given Rice for Kuro which you'll want to deliver to the Heir almost immediately. After doing so, head back to the Inner Sanctum and you'll see the woman want a Persimmon now. The apes in Senpou Temple drop them if you're missing one. After you've done this, you can travel into the Folding Monkeys arena and speak with her again. Head back out and towards the Inner Sanctum once again to speak. She will mention that there is an enemy deep within the caves nearby. Head to this cave and you should find a corpse at the end of the tunnel with a scroll. Take the scroll and give it back to this girl. After this, she'll ask you for the two Serpent fruits we snagged previously. Give them to her and walk back to the idol. Rest twice. Head back in to speak with her. She will then give you the item for the ending. After you receive it, head through the game like normal and you should be able to choose the Return ending or the Immortal Severance ending when you beat the last boss. 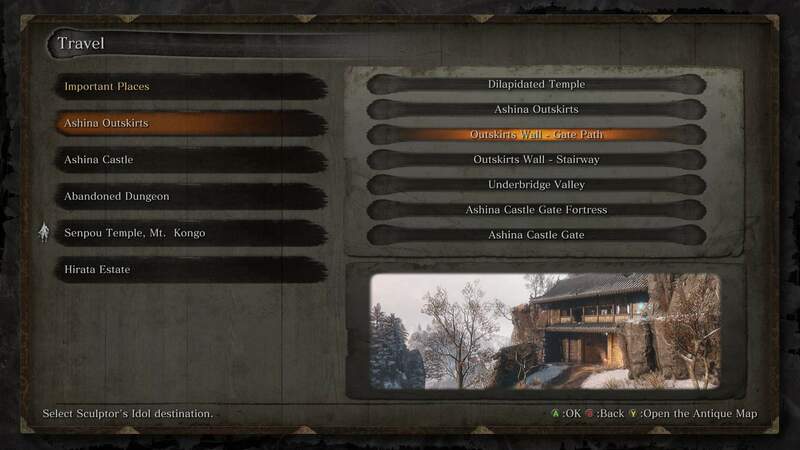 After progressing through the story long enough, you should come back to a war-torn Ashina Castle. 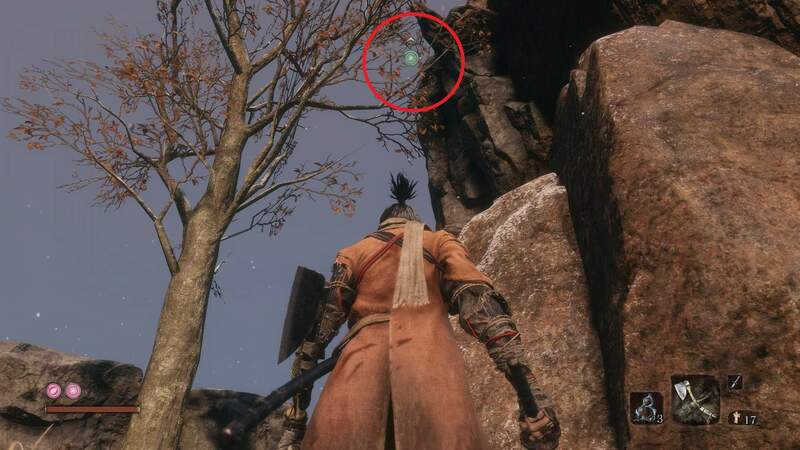 At the same location you fought Genichiro, you'll see Owl speaking with Kuro. When this cutscene ends, approach Owl and speak to him. You'll get an ultimatum. Choose to stay loyal to Owl. When this happens, you'll trigger two boss fights. After you have completed these two boss fights, you will have received the Shura ending and the achievement along with it. After traveling to the Outskirts Wall checkpoint, grapple towards the hole in the building and enter. Upon entering, turn directly to your left and you should find a corpse with a golden item next to it. Picking it up should get you the Shuriken Wheel. (See Merchant Mob Achievement for Details) Travel to the Outskirts Wall and make your way to the Merchant Mob on top of the hill. When you get there, you will find the vendor that will sell you the Firecrackers for 500 gold. I would get this as soon as you can because it works great against beast monsters. In between both the Outskirts Wall Gate Path and the Stairway checkpoints, you'll find an old woman inside of a building. When you speak with her, she will give you a bell that you can use at the Buddha sculpture at the Temple. This will transport you to the Hirata Estate. After the Estate Path idol checkpoint, jump across the walls on the right side until you find a large area with both an archer on the roof, as well as several enemies gathered around a fire. 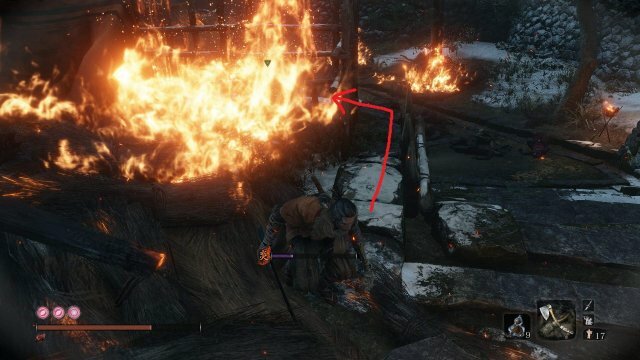 In the fire is the Flame Barrel. 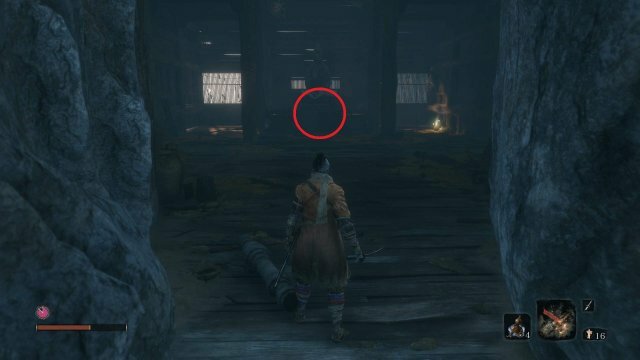 From the Flame Barrel campire, take the path up the stairs until you meet an NPC leaning against the rightmost wall. Upon speaking, he'll give you information about an axe. After this dialogue, you'll find two enemies to the left of this area guarding a small garden house. Inside is the axe. 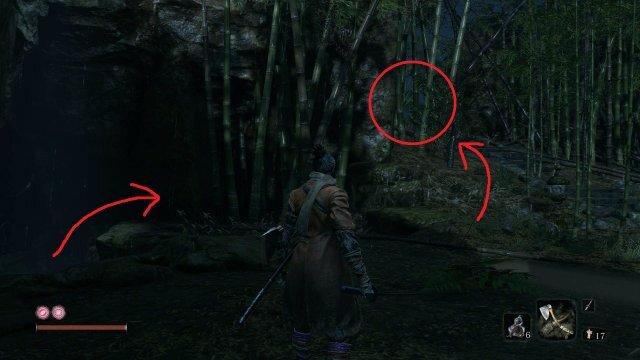 At the Bamboo Thicket Slope checkpoint; past the Shinobi Hunter mini-boss; follow the path a few feet until you have the ability to grapple onto the leftmost tree stump. Jump into the water and swim north. Grapple onto the rightmost tree branch to find a bamboo door. Break the bamboo door and enter the small cave. 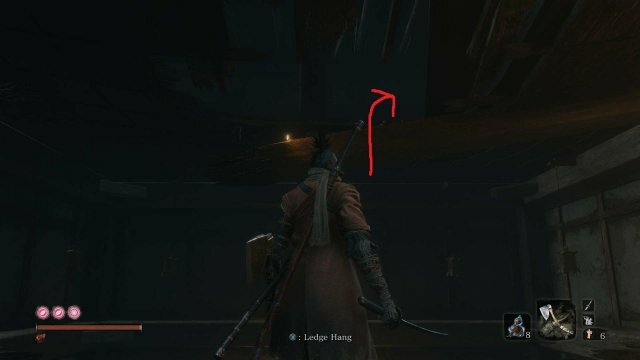 Wall-jump through the cave and up into a small temple. 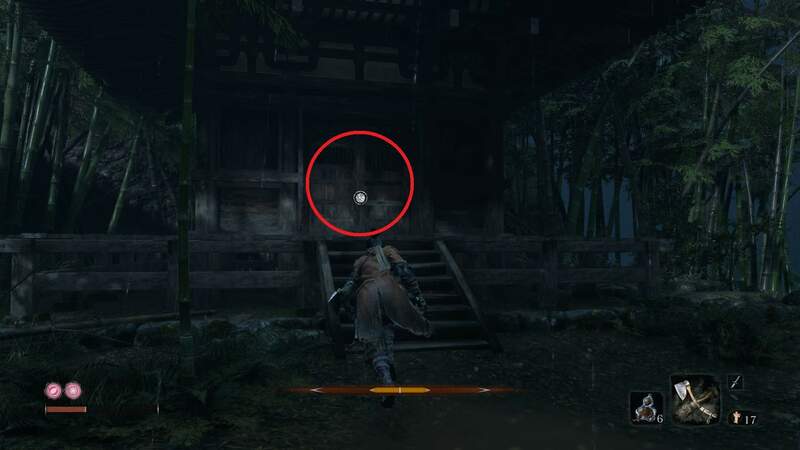 There will be an enemy that spawns, but you can waltz right past him to open the temple door. After opening, your item should be directly inside. At the Ashina Castle, turn back towards the bridge and grapple to the tree branch to your right. Afterwards, move through the gate to eavesdrop on two enemies on the adjacent bridge. Killing them will get you the Gatehouse Key. This is needed for later. 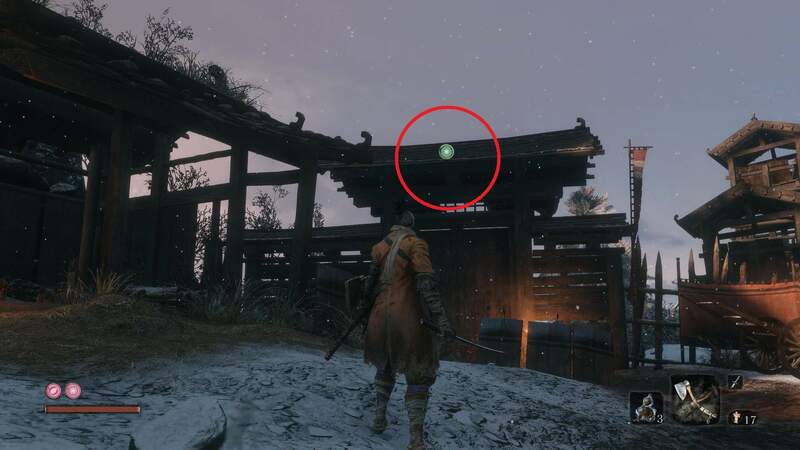 At the Ashina Reservoir checkpoint, directly in front of you will be a large area with multiple hulk enemies and a handful of ranged enemies. Enter this area and to your immediate left, you'll notice a small house. This is the Gatehouse. Opening this will reveal a chest with the item. At the Antechamber checkpoint, you'll notice in the adjacent rooms some traveling blue-robed enemies. 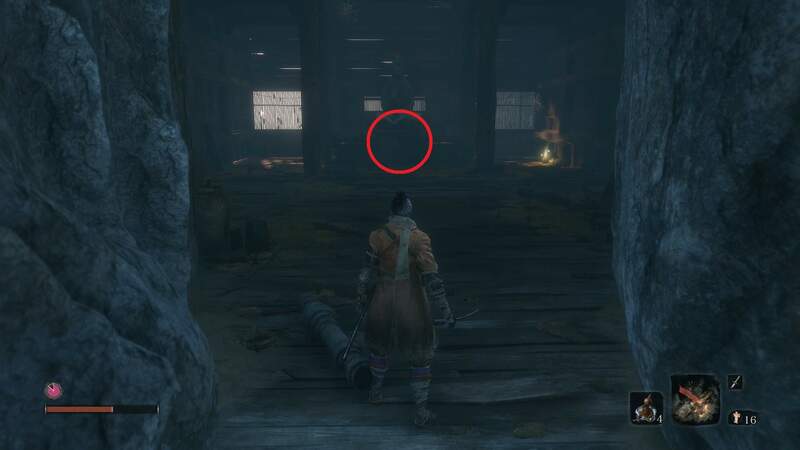 In the center of this room is a large drop that takes you to the first floor. 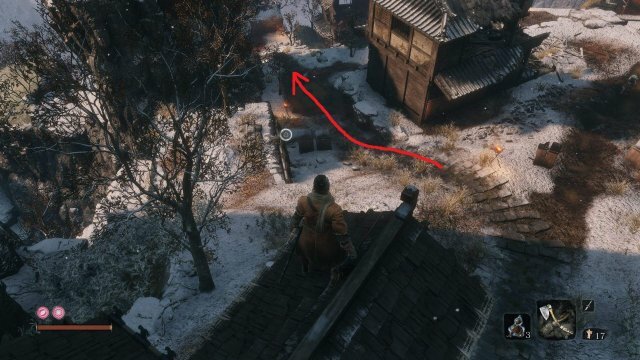 Jump down there, kill the four enemies that are present, and your tool is in a chest near the area. From the Old Grave checkpoint, move to your left and jump down until you find a building with a ramshackle roof. Through the hole you will find a merchant. He sells you the Iron Fortress Prosthetic item. The merchant sells this item for 1600 gold. From the Gun Fort checkpoint, you'll find a small tunnel leading down directly in front of you. Move down and into a small room where you'll be greeted with Long-Arms Centipede Giraffe. Yes, that's the real name. This is one of the most annoying encounters I've had so far. Equipped with two gigantic claws on both hands, he can chain-stun you with his attacks and by the time you've realized it, you've already died twice. Whenever he begins to attack, your first instinct will be to run and wait for an opening to stab. Take it from me, this opening is so short-lived that this tactic is barely worth it. Consider parrying (not blocking) every claw attack. It has the same rhythm every time so you should get it after a few. Your goal is to build posture damage until you can deathblow. This is the easiest way. If you're still struggling, the firework launcher will stun him for a brief moment. Enough so that you can get a couple of hits in along the way. I've said it before, though.. Don't get greedy! Once you've killed him, you'll find the item directly behind him. You will get this upon beating Guardian Ape.